This book contains an edited selection of papers presented at the Eighth Research Conference on Subjective Probability, Utility and Decision Making, held in Budapest. Together they span a wide range of new developments in studies of decision making, the practice of decision analysis and the development of decision-aiding technology. The volume is arranged in sections: Societal Decision Making; Organizational Decision Making; Aiding the Structuring of Small Scale Decision Problems, and Tracing Decision Processes. 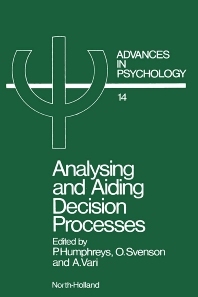 The emphasis is on decision processes and structures and their applications, rather than formal modelling in isolation, thus reflecting current developments in research and practice which follow from the understanding of the nature and operation of decision theoretical models gained during the 1970's. The fifth section, A Symposium on the Validity of Studies on Heuristics and Biases, is of a different nature. The papers take stock of the considerable volume of work investigation heuristics and biases'' in decision making over the past decade, and their implication for theory and practice.